The varying climate and landscape of Maryland supports a diverse population of native shrubs and bushes. The shrubs that grow wild in the Eastern swamps and coastal areas of the state enjoy sandy and muddy soil and hot, humid summers. Woodland shrubs thrive in the cooler temperatures and forested, mountainous terrain of western Maryland. These native shrubs require little maintenance and can add attractive blooms and vibrant foliage to the home garden. The twisted branches of Kalmia latifolia, commonly called mountain laurel, form a rounded shape and grow up to 15 feet tall and wide. In spring, glossy, wavy, lance-shaped leaves emerge, turning from bronze to rich green over time. Pink buds line the branches and open after the leaves, revealing white or light pink flowers. The multiple trunks, exfoliating bark and intricate branches of mountain laurel provide winter interest. 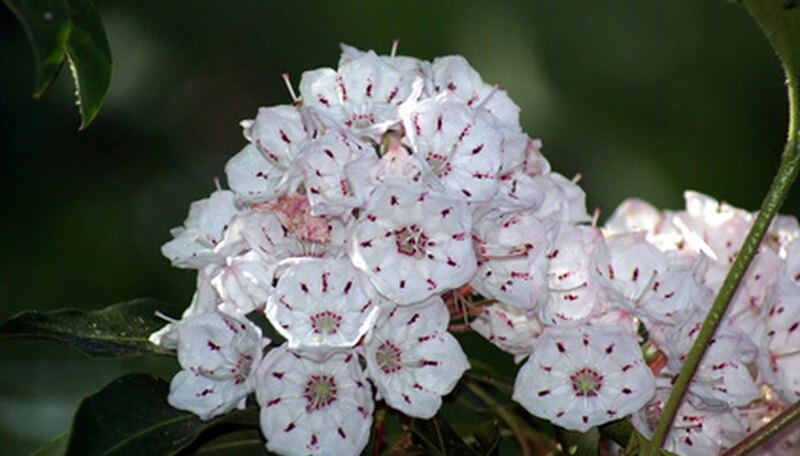 Native to woods and meadows in Maryland, mountain laurel prefers acidic, moist, well-drained soil. It will grow in sun or shade but flowers best in full sun. The evergreen shrub Rhododendron maximum, commonly known as rosebay rhododendron, grows between 4 and 10 feet tall, forming dense thickets. In spring, these shrubs teem with clusters of pink to white flowers and large, drooping leaves. Like most rhododendrons, rosebay requires moist, well-drained, acidic soil with a pH of 4.0 to 6.0. Native to forested areas of the Appalachian Mountains, it will thrive in partial to full shade. Provide a layer of organic mulch to add nutrients and remove old wood during the dormant season to improve the appearance and encourage new growth. The clustered, arching branches of Virginia sweetspire, or Itea virginica, form a mound between 3 and 5 feet tall and 6 to 8 feet wide. The leathery, upturned leaves turn vivid shades of red, orange and yellow in the fall. In early summer, 4- to 6-inch long spikes of star-shaped white flowers bloom, opening successively from the bottom of the spike to the top. These lightly scented flowers often attract butterflies to the garden. Virginia sweetspire grows wild in the swamps and wet woods of the coastal plain in Maryland. Although it grows best in moist soil and full sun, this adaptable shrub will also tolerate wet or dry soil and partial shade. Prune back in winter or after flowering to maintain a neat shape and remove old wood. Red chokeberry, or Aronia arbutifolia, is an upright, rounded shrub that reaches up to 10 feet in height and grows 5 feet wide. Round clusters of white flowers bloom in the spring, followed by bright red fruits that persist through winter if not eaten by birds. The branches feature smooth, gray bark with accents of purple and bear dark green, rough leaves that turn bright red in the fall. Although red chokeberry grows wild in swamps and bogs, it adapts to most soil conditions when planted in full sun or partial shade. Prune this shrub regularly to keep it looking neat.